A quick peak in Firebug reveals the beautiful simplicity! Hopefully it's fairly obvious that each date doesn't have it's own unique graphic. The dates are pieced together from a single graphic (css sprites! ), where different smaller parts of the graphic are shown in the three different regions: day, month, and year. Perhaps you'll recognize this from a similar technique Joost de Valk posted about nearly a year ago. The CSS is where the sprite action really happens. With those special class names that we have set up in the HTML, we can set which portions of the image to use. First, we set relative positioning on the parent. Then we absolutely position each of the three regions within. We set all three of them to use the same background image (our sprite), set their respective widths and heights, and kick the text off the page. Then, we set each of the months (12 possibilities), days (31 possibilities), and years (goes 10 years out) with the specific background positioning needed to show the specific region we need. Waw. Thank you for sharing the trick. heh. Yup. I immediately assumed this post would be about learningjquery.com as well. Nice trick as always Chris. Good job! This sprites technique is really nice, I use it a lot, however I have issues when using transparent png sprites for IE6, you’ve shown the Unit PNG Fix, however i seem to get some issues when applying it to sprites. Any ideas on what I might have been doing wrong? The alphaimageloader filter doesn’t support css background-position, so you can’t use it with sprites. The DD_belatedPNG js fix has decent background-position for PNG. You can get it here: http://is.gd/1Rcrt Hope it helps! Damn that IE6. Yeah, it’s a bummer, IE6 doesn’t handle transparent pings good at all. A solution would be, if it’s a static element like the date example, to use a conditional CSS file and use a solid png image. If it’s a change of position on hover, then in the conditional CSS set it to not change, it’ll still be functional just less visual feedback. Hey Thanks!, the DD_belated works just fine :), and I wasn’t aware of the Fireworks option, although I use it all the time! !, thanks. 8-bit PNGs work fine in IE, I believe. It’s a different and cool look. Very creative use of sprites! Nice of you to go in-depth to show us how it’s done, Chris. A bit off-topic: Too bad the colour contrasts are so low that it’ll be hard to see on some screens (I’m on a laptop now, and had to bend the screen even more to really read it). This looks like an interesting technique. The only possible drawback I see is all of the extra CSS needed for the display. That’s a lot CSS to download just to have a fancy date display. You are right. But since each graphic item is in a predictable place, you could use jq to produce the css. i.e. each date might be, say, 50px down from the next, so dayycoord=day*50 sort of thing. You’d have to add code to deal with dates over 16 (or live with a longer graphic with just two columns: column 1 = months followed by years. Column 2 = days. You could also use something like LESS to automatically generate the different background positions. very much helping tips of CSS. My mind has blown right open. Never thought of using it this way. It won’t be long before we’ll see just as clever variations on this ! That is an awesome use of sprites! Throw in a comma (,) for “Jun 30, 2009” with a class that will be display:none. You’re absolutely right. Spans would be a better choice. Should have done that first time around. Will update the html as soon as I get a chance. Woooow thanks for the tip, and easy way to do it!! That’s a sweet little trick they use. Good explanation of the implementation, homefry. Very smart use of sprites. Wouldn’t it be smarter to determine the position of the image by the class? Would need either js or css generated on the server, but that’s got to be better than typing around 50 declarations. Very cool. can’t wait to put one together. Now, I have got to give that a go on the HiddenCSS re-think. yeah! that’s more like it! I was in LearningKquery.com site just before enter in CSS-Tricks. Weird! Very cool, Chris! Require some work, but the final result is awesome! While it’s a nifty idea and definitely looks cool, practically speaking, the sprite and css make for a much larger data payload to the page to display at most a handful of dates. In this particular example, there’s also no need to include the month or day in the sprite except to ensure the font. This is awesome and very very clever. Thanks! It’s pretty much a hack that will break CSS2.1 validation (who cares), but stay tuned to CSS3. There are a couple comments to the tune of how much “extra CSS” this is. I just want to be clear that the above technique, and css sprites in general, are actually incredibly efficient. If each one of these dates/months/years was a separate graphic, it would require even more css and slow things down substantially with all the additional http requests. Yeah, but you still could’ve saved yourself a fair amount of rules by using actual text for the parts of the date that don’t need to be rotated. That way, for the most part, the text size can still be increased for those who need it to. I wasn’t thinking so much of text resizing (accessibility), but rather efficiency, when agreeing with John that “Month” and “Day” could/should remain text. Only the “Year” is rotated & requires an image. Additionally, why not make the “Year” a sprite image of rotated numbers (zero through nine) and piece it together in a similar fashion so that ANY year may be represented, instead of a hardwired “range” of years? NOW you have my attention! I dont see how much more you would save taking out the days and month, it would only be really minor as its going to be a tiny png anyway. Plus keeping them all images will keep the font display uniform. As we all knows, fonts display differently on different computers. i like the i information, how about cutting down on a little divitis though and making the month/day/year into paragraphs, or even setting it up with a paragraph and 3 spans. Yes you would have to do a display:block, the information still comes across. It’s a tiny part of all code. Even better, making each entry a .hentry, and marking the date up with microformats. Paragraph tags wouldn’t be appropriate for the bits. Spans, yes, but that’s already been covered. Paragraph for the wrapper’s a fine addition. So far as using semantically rich content goes, though, the wrapper could well be a header, any one you like. Datelines are pretty much subheaders, and that’s how I mark them up, generally. Interesting use of sprites, good food for thought! A bit of divitis in the markup, but nice solid sprite example/article. Smart use of css sprites, I like it. very nice technique, i save this picture of date sprites some months ago and also want to learn this technique, but unfortunately i forgot where i download and where saved. thanks alot for sharing. Thanks for sharing. Might be useful for blog designs when a date is required. Can’t see myself rotating the date clients on more corporate websites, but what a great use of CSS Sprites! Okay, this might be efficient, but it would be more efficient to use php or something like that to only output the css that applies to the current date/time. I was just on that site looking up some info to spiff up an accordion, and then I saw this! I was admiring those numbers — thanks for the explanation and examples! Always great. CSS sprites are a new technique i’ve learnt from css-tricks.com and it’s awesome. Hope that makes it through the WordPress parser. ABBR’s an interesting choice. Title attribute timestamp’s a wonderful addition. Excellent rewrite, and use of the abbreviation tag combined with exchanging the nested divs with spans! One other quick addition, the .postdate style needs to be updated to include display:block as the abbreviation tag is an inline element. I have been wondering how to do this for a while. and its a wonderful technique, my only question though is how do you get it to recognize what month, day and year it is, and then choose the correct image accordingly? This sorta raises the question–at least in my feverish mind–about being able to program or script CSS. Is that possible? How conditional or parameter driven can CSS be? i will defo be try it out. I would actually have used spans instead of divs, so the text would render on one line (when CSS is turned off). And also render the content to a more readable format. @Micheal Short Look at the HTML. The system that generates the dates writes unique classes for each day, month and year. 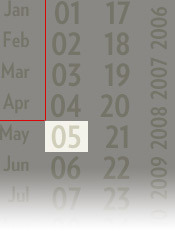 For example: the class ‘m-06’ stands for month 06: June. After reading this I decided to play around with a clock using an image sprite and the same idea for positioning the background to display the correct details – it’s not perfect but uses a similar idea with a sprite. Forgive me if the JS is a bit clunky, it’s not my strong point. Some new folks might think it’s a hard technique, but it’s not at all. I actually just look in Photoshop’s measuring tool at first to get as close as possible to the coordinates, then use my Developer Toolbar to edit the css on the fly, and get the correct position. This way if it’s a couple pixels off, I don’t have to refresh a billion times which you might think you’d have to do. I’m also against generators, but there are some for sprites which work really well. My main reason that I don’t like them though is you can position them where you want to. Chris, can you make the comment inputs save your details though? I used to be able to just click them before to get the dropdown, or it’d already be all filled in. Chris is always great, nice job again dude, been waiting for this one for a long time, thanks. Chris, this is a good article, I was also thinking on write about this in my website but you do it first. In my site (www.mariuzzo.com) I use the same technique, please take a look. This is a great tip…. I Digg it. This is really great technique. Sprites to the rescue! Wou, nice article about sprites! Really helps to understand this technique thru clear example. Would be nice to see more different and practical stuff made with sprites, because I think this technique will be very popular and “what everyone should do” in near future. Hey this trick work in blogger? Great use of sprites, thanks for sharing this it is fantastic. Thanks for sharing this. Very effective use of sprites. It’s cool. But I tried in IE 7. The vertical year 2009 has more margin than in FF. And It came out of box, if I set it in a box together with date. Is there a way possible to use Sprites in for background image. means REPEAT it. I google it but can’t find anyway which can help me to use Sprites in Background image. That’s what we called awesomeness. One of the best date box, without having any image actually. Awesome idea – love it! You’d have to pull all the day numbers into a single column unless you want to get funky with the rules…and maybe giggle the -heights a bit. Thanks for taking the time to showcase the “shorthand” method there… my CSS know-how is a bit limited, but things like this are making me better and better.